SEOUL, SOUTH KOREA, October 04, 2018 — Marquis Who's Who, the world's premier publisher of biographical profiles, is proud to present Young-ran Rim with the Albert Nelson Marquis Lifetime Achievement Award. An accomplished listee, Ms. Rim celebrates many years' experience in her professional network, and has been noted for achievements, leadership qualities, and the credentials and successes she has accrued in her field. As in all Marquis Who's Who biographical volumes, individuals profiled are selected on the basis of current reference value. Factors such as position, noteworthy accomplishments, visibility, and prominence in a field are all taken into account during the selection process. Ms. Young-ran Rim is a talented and tenured artist in Seoul, South Korea, who is renowned for creating life size sculptures. Utilizing a mixed use of materials such as stone and bronze, her abstract art has captured the hearts of many over the years, both literally and figuratively. Known as the “heart artist,” many of her sculptures have been carved into the shape of a heart and are bright, shimmering and red in color. A result of her ability to confirm human existence through the visual transformation of the aesthetic impression mediated through sound, Ms. Rim's works are more than just figures. Focusing her efforts on film, music, dance, theater, architecture and photography, she has overcome the impossible of visually seeing the existence of music and sound. Among Ms. Young-ran Rim's countless works, “Seats-Joy” and “Seats-The Continuity” are just two pieces of her artwork that convey a symbolic message through music. Reinterpreting the image of white and black keys as a compositional modern sculpture, the impression of the sound of the piano is loud and clear. Ms. Rim's portfolio also includes many paintings and photographs that demonstrate a bright, vivid use of color and shapes throughout, which can notably be found on her website. Throughout her career, Ms. Young-ran Rim has hosted 19 solo exhibitions, all of which have been in Seoul, with one exception in Busan, Republic of Korea. This exhibition was featured in 2013 and titled “To Breathe in It” at the Suga Gallery. She has also been in 176 group exhibitions in places such as the Republic of Korea, France, China, Singapore and the United States. Most recently, she was featured at the Opening Exhibition of Art at the Art Deborah Gallery in Seoul in August 2017. Furthermore, Ms. Rim's works have been included in nearly 20 permanent collections, as well as installations in private homes in the Republic of Korea, as well as one in Taiwan. Ms. Rim taught as an adjunct professor of environment and sculpture at the University of Seoul between 2003 and 2005. In 2005, she served as a judge at the Korea Open Art Festival, where she judged figurative art work pieces. Recognized as a professor of lifelong education by the Korea Culture Education Association, Ms. Rim is also an honorary ambassador of Bronze Sculpture. Affiliated with multiple professional organizations, Ms. Rim is a longstanding member of the Korean Fine Arts Association, the Korean Professional Artists Association, the Korean Woman Sculptors Association and the Salon de la Société Nationale des Beaux Arts in France. 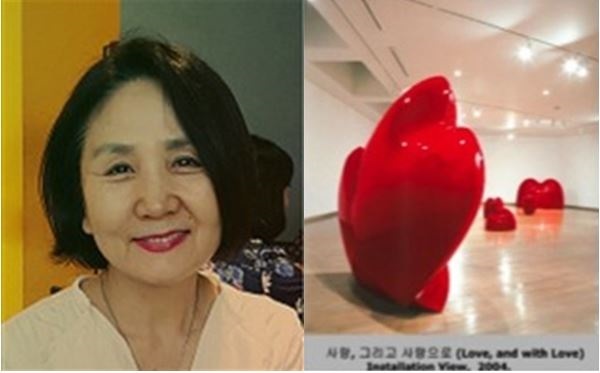 She has served as a senior advisor and vice chairman of the Ewha Sculptors Association, senior advisor of the Songpa Provincial Art Association and chairman of the board of the Korea Color Therapy Promotion Association. Additionally, Ms. Rim chaired the International Color Therapy with the Korean Color Psychology Association, the Alumni Association of Ewha Womans University and the Hanmi Lions Club District 354-D. Earning several awards and recognitions for her work over the past decade, Ms. Young-ran Rim recently received a Korea Youth Grand Prize by the Korea Culture Education Association in 2016. She also received a Culture Education Grand Prize by the Korea Culture Education Association in 2015 and an Invited Artist Award at the Korea Artisans Festival in 2013. Ms. Rim earned a Bachelor of Fine Arts in sculpture at the College of Fine Arts at Ewha Womans University in 1978, followed by a Master of Arts in art education in 1985. In 2012, she completed a management course of future culture at Sookmyung Women's University. Married to husband Hong-ki Kim, Ms. Rim is the proud mother of one son and one daughter. For more information, please visit www.rimyoungran.com. In recognition of outstanding contributions to her profession and the Marquis Who's Who community, Young-ran Rim has been featured on the Albert Nelson Marquis Lifetime Achievement website. Please visit www.ltachievers.com for more information about this honor.